Horace and Frances discuss the New York Times Crossword Puzzle: Boswords 2018 - Special Report! Hello Crossword Puzzle Fans! I spent a very pleasant afternoon at the second annual Boswords tournament, and I thought I'd write a little about the experience. The Championship Puzzle being contested. Once inside, I saw some familiar faces from the American Crossword Puzzle Tournament (A.C.P.T. ), including one former champ. There's a fair amount of mingling out in the lobby, and then we all move into the gymnasium and settle into our seats (plenty of them, no fretting about that). John Lieb (who seems like the nicest guy) says a few words, and the puzzles are passed out. Following the model of the A.C.P.T., the first puzzle is a softball, and after that was an entertaining lesson on solving a crossword, with advice like "When you are stuck at the end and have some blank squares, just make them into extra black squares!" But more than just recount my puzzle solving experience, I want to encourage you, if you enjoy crosswords and you have ever thought of attending a tournament, to consider this one. It's smaller than the A.C.P.T., and although the vibe in Stamford is plenty friendly, this kicked it up a notch. As I said, John Lieb and Andrew Kingsley - and really everyone associated with this thing - seem really nice. After the third puzzle they handed out pizza (plain cheese only - a decision I applaud), various individual-size chip and snack bags, and what appeared to be homemade chocolate chip cookies. I wasn't expecting that! Also at the break (or after it, I guess), there was a performance by the Boston Typewriter Orchestra. If you've never heard of them, they are kind of like Stomp, but instead of prancing around a stage with brooms and trash cans, they're seated in front of typewriters at a table. It's kind of fun to hear them pounding away for a while, but after the fifth "song" (they performed again before the final), and maybe even a little before that, I had heard about enough. Still, I appreciated the effort to provide a little more entertainment (and, oh, did I mention that the entry fee is just $20?! ), and the opportunity for a new experience. At the end of the afternoon, the final puzzle was contested. 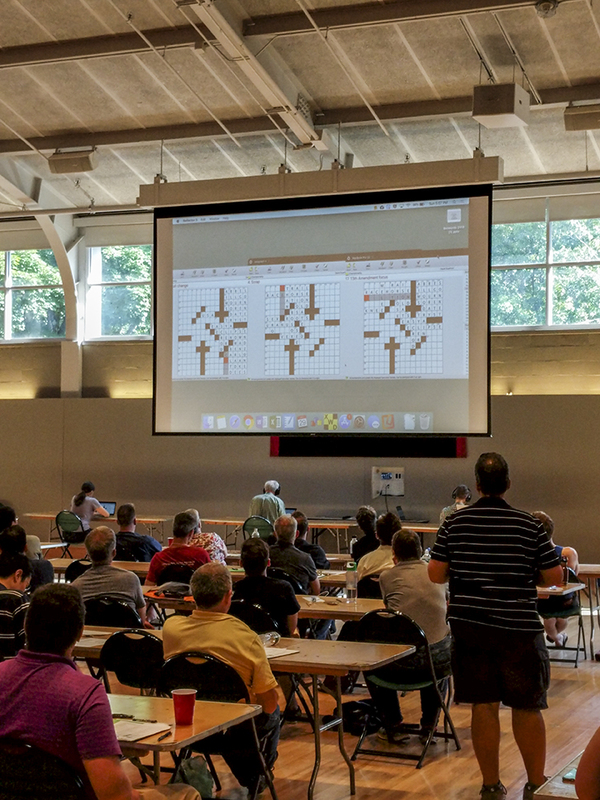 At the A.C.P.T., the competitors are on stage solving on extra-large grids, but at Boswords, they solve on computers, and their screens are displayed above them on a huge screen. I found that I was able to follow the action much more easily with this method. It was fascinating to see the way they moved around the board, and the solve of the eventual winner was a thing of beauty. She didn't get anything in the top left, but found a foothold in the top right, and moved calmly, but quickly, through the entire grid, working a section completely before flowing into the next. Congratulations, Katie Hamill, on an impressive win. One last thing - as the champions were named in the "Paw Sox" and "Pairs" divisions, it occurred to me that all the champions at this year's Boswords were women. Cool. So that's kind of a lot of writing, but I had a great time. Thank you, Boswords Team, for a lovely afternoon of puzzling. I will definitely be back next year! Ooh, doing the final on computer does sound like a good way to make it visible. (In addition to the obvious issue with the whiteboard method—being able to read from many rows back—the body of the competitor tends to block the view).